Over the weekend, I came across a food truck that I’ve heard of, but only through epic legend. I finally got to set my eyes on the Cheese Wizards truck. 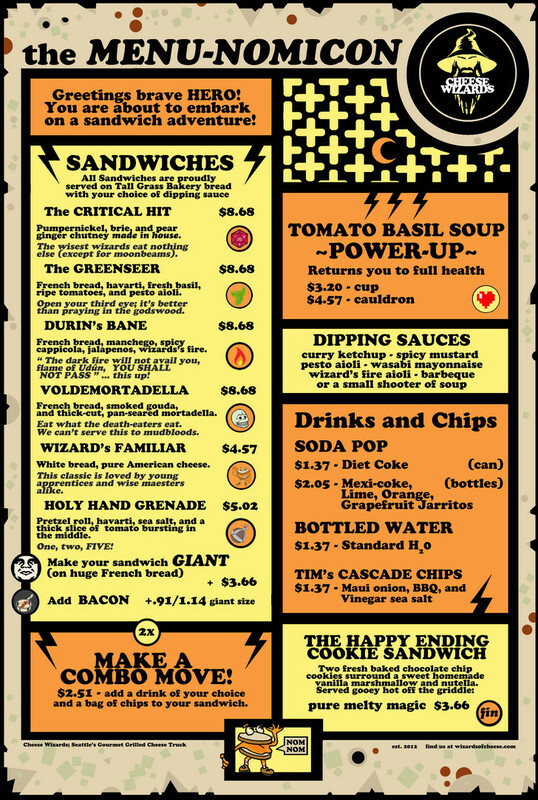 If you like grilled cheese sandwiches, delicious tomato soup, and geeky references, you need to find this truck ASAP. We tried the Greenseer and the tomato soup. The cheese on the sandwiches are first melted with a torch and then grilled so the cheese and bread both end up the perfect consistency. The tomato soup is handmade and topped with creme fresh and their own version of the cheese crackers I mentioned yesterday. No matter what you get, you’ll be happy. Cheese Wizards conveniently parks itself at breweries and wine stores around Seattle. The next time you find yourself grabbing a beer or a bottle of wine, you just may find yourself in the company of wizards. Find out more at WizardsofCheese.com. Have you tried Cheese Wizards? What menu item would you recommend?